PARVEEN Wireline Spears are used in general fishing operations when wire is bundledup very badly and two prong wireline grab can not engage it. 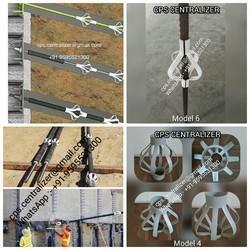 PARVEEN Fluted Centralizers are used in deviated wells to ensure that tool string is atcentralized position. Our range of Spiral Casing comes in high quality FRP material and is used hydro turbine engineering quite often. Besides hydro turbine, Spiral Casing has often been in use at automobile testing centers and aerospace research. Keeping the variety of use in mind, Shashi engineering offers its clients a high range of customization on this product. PVC casing centralizers are available in all sizes from 32mm to 630mm in various pressure ratings and colours.our centralizers are durable and have high resistence to all kinds of chemicals, oils etc.we can manufacture centralizers as per the customer's requirement. The SINGLE PIECE CENTRALIZER is newly designed integrated steel flexible Centralizer used to centralize casing during the cementing stage of oil wells. Fully integrated (SLIP-ON) centralizers are manufactured in any diameter and as per customer requirements.